T20 series of two matches started yesterday between Pakistan and India and guest team got success in 1st T20 by 5 wickets due to brilliant bowling by Ajmal, Gul and Irfan and awesome batting by Shoaib Malik and Captain Muhammad Abdul Hafeez. After T20 matches three ODI matches will also be played. 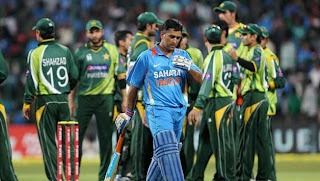 Until yesterday afternoon some people where claiming in arrogance that Pakistan will not be able to win even one match against India in this tour but Pakistan beaten India in first match and now the debate is changing that how much chances Pakistan have of winning T20 and ODI series against India after first brilliant win? I think the chances are very high and there are several reason for this. 1 India's bowling is very poor. no Indian bowler except new boy Bhuvneshwar Kumar created much problems for Pakistani Batsmen in first T20. 2 Second reason is that Pakistan's bowling is very good. Bowlers like Ajmal, Gul, Irfan and Afridi can destroy any batting line up of the world. 3 Third reason is that many good Indian players are out of their squad or they are out of form. List includes Sachin Tendulkar, Virender Sehwag, Zaheer Khan, Irfan Pathan. 4 Next reason is that Pakistan's batting line is also good even though its not as powerful as the Indian batting line up but still it has some quality Batsmen capable of playing good innings. So these are the four reasons which can help Pakistan in winning both T20 and ODI series against Dhoni 11 after 5 years long time.